Neurons in the visual cortex that project to different downstream areas tend not to be connected to each other even though they are functionally similar. In the primary visual cortex, like usually talks to like. In the mouse, for example, scientists have shown that the more correlated two neurons’ activity is, the more likely they are to be connected. But new research published in Neuron by Mean-Hwan Kim, Petr Znamenskiy and their colleagues demonstrates an exception to this rule. The researchers found that neurons that project to two different secondary visual areas — the anterolateral and posteromedial areas — are unlikely to be connected, even if they have similar activity patterns. Using retrograde labeling, the team, from the University of Basel and University College London, identified neurons in the primary visual cortex (V1) that project to the anterolateral or posteromedial area. Very few neurons in V1 project to both areas, so they form two separate V1 subpopulations. 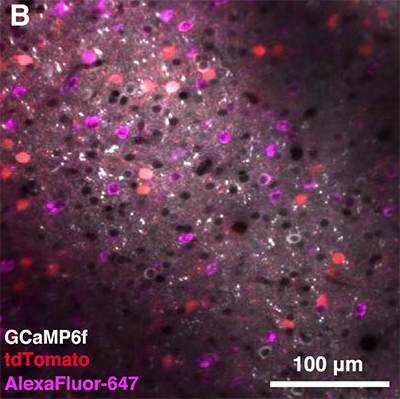 The researchers analyzed the connectivity of neurons within and across these separate V1 subpopulations by stimulating action potentials in one cell and using current-clamp recordings to observe synaptic effects in the others. They found that two neurons that project to the same area are connected to each other at a rate that is roughly similar to that of any two random V1 neurons. On the other hand, cells that project to different areas connect at a much lower rate — roughly one-quarter to one-third the rate of the general population — suggesting that these cells are somehow actively avoiding each other. Cells that project to the anterolateral and posteromedial areas tend to have different firing patterns. But these differences don’t account for the low likelihood that these two types of cells will connect to each other. Researchers used the previously measured relationship between connectivity and correlated activity to quantitatively predict the connectivity rate for neurons that project to different areas. The measured connectivity rate was significantly lower than the prediction. Thus, neurons in these separate populations appear not to follow the standard fire-together, wire-together rule. Researchers don’t yet know why V1 segregates neurons that project to different regions. But they propose that this division may enable top-down connections to target the populations individually, allowing information to be more easily routed through different pathways.